We hate feeling restricted or deprived, and that is a huge reason why many of us have so much trouble losing weight. In this episode I’ll be helping you understand a little better how restriction and deprivation are really just feelings that you can have control over. When you understand where they come from and how they are triggered, you have the power to lose weight without feeling deprived. There’s nothing magical to it, it’s simply the concept of understanding these emotions and removing the dramatic thoughts that are untrue and do not serve you. By not allowing yourself to get tricked by these thoughts, you will be able to navigate weight loss and choose the foods that fuel you best – without the drama. Why restriction and deprivation are the biggest reasons why weight loss is difficult for people. What restriction and deprivation actually are and why you have control over those feelings. The importance of getting to know these feelings and what triggers them. Focusing on the math and what fuels your body the best rather than the drama of feelings. Examples of the thoughts that let these emotions take control. How to become more aware of these feelings and not let your brain get confused. 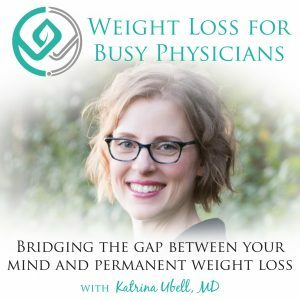 Katrina Ubell: You are listening to, The Weight Loss for Busy Physicians Podcast, with Katrina Ubell, M.D., episode number 95. 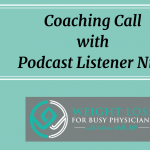 Welcome to Weight Loss for Busy Physicians, the podcast where busy doctors like you get the practical solutions and support you need to permanently lose the weight, so you can feel better and have the life you want. If you’re looking to overcome your stress eating ane exhaustion and move into freedom around food, you’re in the right place. What’s up my friend, how are you? Welcome to the podcast. I got a good one for you today. This one I think is gonna really change things for a lot of you. I just have to say that I’ve got a puppy by me again and she’s being a little loud, but it’s better than her barking, so you may hear her kind of scraping around in her crate. She’s doing the best she can, she’s just a little girl. She’s so cute. I should seriously post a picture of her on the Facebook business page, on my … for Weight Loss for Busy Physicians, so you guys can see how cute she is. I can’t even stand it. We keep saying that she’s like a cartoon character. She’s just like a stuffed animal. It’s a good thing they’re so cute, right? We end up not being so mad when they pee on the floor, which happened this morning, in fact. But we’re getting there. We’re getting there. Okay. I want to talk to you today about the feelings of restriction and deprivation, okay? ‘Cause I get questions a lot. How can I lose the weight without feeling restricted. I have to pick a plan to lose weight that doesn’t make me feel deprived. This is what people say. We don’t want to feel restricted when we’re losing weight, and we don’t want to feel deprived. I think this is a main reason why we don’t keep up weight loss plans, right? Like if you did Weight Watchers and you just kept counting points for the rest of your life, you’d probably keep the weight off, right? Some people have done that. Not a lot, but some have. Right? Right? So often we’re like, oh, Whole 30, okay I did that, but I felt so deprived and restricted after the 30 days and went right back into my old way of eating or I kinda resolved to stick with some of the things, but then before I knew it within another month I was right back to eating the old way that I was always eating. Right? We don’t want to feel restricted and we don’t like to feel deprived. But, what are restricted and deprived? They are feeling. They are emotions. So, what creates your feelings? Is it your eating plan? Is it what you get to eat and what you don’t get to eat? No. It is your thought about it. Right? Your thoughts create your feelings. Your thoughts are what are making you feel restricted in your eating plan. It’s your thoughts that make you feel deprived when there’s foods not on your plan around you that you aren’t eating. What? So wait. That means that I have control over whether or not I feel restricted or deprived? In fact, that is the case, right. We think that the plan needs to be a certain way or we need to be able to eat certain foods in order to not feel restricted or deprived, but that is not what it is. It is our thoughts and the way to not feel deprived is not defined fake or lower fat versions of foods that mimic things that you want to eat. You don’t need to be able to eat tons of variety in order to not feel restricted or eat all the time. All you have to do is manage your mind. Once you’re managing your mind, the drama is all taken away. So then all that’s left is the math and the math is eating in a way that serves your body. So when you’re not worried about what’s gonna make you feel restricted and deprived, you can just chose a way of eating that your body loves. So for some that might be eating vegetarian or even vegan. For some it might be eating low carb or going full on keto. For some it might be eating kind of a balance of all the macro nutrients. Some of you might like to do paleo and eat more protein. But then you’re basing your decision on what is fueling your body well, what makes you feel physically good in your body, rather than basing your decision on what your thoughts might be about what you get to eat. So you never have to feel deprived. You can go through a whole weight loss journey and never feel deprived. Here’s the thing. The thoughts that create the feeling of deprivation aren’t even true. So, let’s play with this a little bit. Thoughts like, I wish I could eat that. It’s not fair that other people can that but I can’t. I’m so bored with this way of eating. We think that we’re just stating an observation that we’ve made. It’s just something we’ve noticed, but they’re all thoughts and they’re not even true, because you can eat anything you want, whenever you want it. So if you’re choosing to follow your eating plan, instead of eating whatever whenever, then it makes no sense to think that you wish you could eat the brownie. Right? Like you’re wishing you’d follow your plan so you can lose weight. So you’re following through on making that result happen for yourself in your life. Like, that’s what you really want. You don’t really want to eat that. So when you have that thought of, I wish I could eat that, that thought is what is creating that feeling of restriction and deprivation. This is when awareness of your thinking is so key. When your brain offers you the thought, I wish I could eat, you recognize that it’s a thought error. Okay? A thought error is just a mistake. It’s not like something’s fundamentally wrong with you, it’s just like something you can just erase or we sometimes just think about hitting the delete button on it. It’s like, oh, that’s not a good one. Like little error there. It’s not really true. You don’t wish you could eat. The part of your brain that’s offering that thought to you is just confused. It’s your primitive brain that’s very desire and impulse based. But when you believe every little thought that your brain pops out at you, you can end up switching thought models. You’ll go from the thought model that keeps you on your plan and creates the results you want, to a different thought model that creates the feelings of restriction and deprivation, and we know what those feelings always end up creating, right? Episodes of over eating. Sometimes that binging, sometimes it’s just urge driven overeating, maybe it’s just a handful extra of nuts. It doesn’t matter, right? It’s all eating that’s being driven by emotions that are not serving you. You don’t need that extra food. But eating this way ends up creating the result of not losing weight or possibly even gaining weight. So, since we don’t even recognize what’s actually creating these emotions, we blame this on our plan, right? Well, couldn’t eat that way because it wasn’t sustainable. It just wasn’t sustainable to eat that way. Have you ever said that or heard other people say that? I just couldn’t continue doing it, it just didn’t work for me. It was too restrictive, I just felt too deprived. Right? No. What wasn’t sustainable was the way you were thinking when you were eating that way. What wasn’t sustainable was you resisting the emotions and avoiding them by eating off plan food. Because even if you can’t recognize the thoughts that are creating the feelings of deprivation and restriction, if you’re willing to feel the emotions and process them, rather then making them go away immediately by eating the food, you can interrupt that model before you take the action of overeating. So you have the thought that creates the emotion of deprivation or restriction, and you can interrupt the model there before you go into eating. So, what you do then to interrupt the model is you go into your body. So out of your head and into your body. Someone just said to me the other day, it’s like you pith yourself. I was like, oh my God, brought back memories of pithing frogs in college, that was not pleasant. Anyway, I digress. So you’re gonna go out of your head and go into your body and name the deprivation and restriction feelings. Get to know them better. Get really good at feeling them. I want you to start going, I am a pro at feeling deprived and restricted. There’s nothing wrong with me feeling this because I’m actually not deprived and restricted, it’s just my thoughts that are creating this. So be curious about them. What is going on that’s making you feel these feelings. Let yourself feel it. Breathe into it. Relax your muscles. I told you before, resisting the emotion is like trying to keep a beach ball under water. Allowing it is just letting it float on the surface. Just let it be there, no resistance, no thinking that things should be different. No thinking that things are going wrong, just letting it be there. This is what we’ve got right now, we’re just gonna let it be there. So you let it pass and you’ll find that over, probably a short period of time, it’s gone and you’re onto the next thing. But, you don’t want to just skip over the next step, because then it’s time for some thought work and you don’t have to do that immediately, right in that moment, if it’s not convenient for you, but probably later that day, or the next day, you should spend some time there. What you want to do is figure out what were your thoughts that created those feelings. Oftentimes I hear this so often, there wasn’t a thought, I just didn’t have a thought. But you did. It really could have just been as minor as, that looks good, or I want that. I wish I could eat that. It’s not fair. I wish I could eat that and still be thin. Like things like that, right? We don’t even recognize those as thoughts. We’re like, no that’s just a fact, that’s just what I wish. But that’s a thought. Can you see that the food that you’re not eating is neutral and that it’s your thoughts that are creating the uncomfortable emotions. Okay? So it’s not the platter the cookies that’s creating the uncomfortable emotions. The cookies are neutral, it is your thought about them. There’s a girl that I went to medical school with and she would get a migraine headache every time she ate chocolate. Back in those days, I used to make these really delicious, homemade, chocolate chip cookies and sometimes I would make them and bring them in to share with everybody and I remember her saying, oh if there’s chocolate in there I just can’t have them, otherwise I’ll get a migraine. I remember just thinking to myself, gosh that’s just so sad. Like in my mind, I’m like I’d feel so deprived I couldn’t have these delicious cookies. What I would actually sometimes do is before I added the chocolate chips then, I would scoop out a cookie or two for her and bake it and then add the chocolate chips so that she could have a cookie. Right? This is how much I’m like, no but she has to be able to have a cookie, I don’t want her feeling restricted or deprived, ’cause I know I’m not willing to feel that way. It’s so funny, right? So you just have to think though that the food is neutral, right? She’s looking at that chocolate chip cookie and going, hm if I eat that I’ll get a migraine headache, not worth it to me. I don’t think she felt deprived or restricted, she was just like yeah, I just don’t eat stuff like that, it makes me sick. Okay. We also could have a thought of like yeah, I just don’t eat stuff like that because it doesn’t give me the results I want in my life. The end, right? Sometimes we can recognize that it’s our thoughts, but we can’t come up with a different thought in that moment that feels true and believable and that is okay. Right? Sometimes we’re like, I just need a new thought, what’s my new thought, if I can’t have a new thought then I just can’t do this, and that’s not what we’re about, right? When you can’t find the new thought, you just work on taking full responsibility for your emotions. Remember that’s called emotional adulthood. Not giving anybody or anything else credit for how we feel, we recognize that we are creating our emotions, not anyone or anything else. So if we’re willing to feel all the emotions, feel these emotions of restriction and deprivation, then they really do go away relatively quickly. Where resisting them makes them more intense and more uncomfortable, and then that usually results in us eating all that food that we wished we could eat. Right? It just creates just so much desire and such an urge that the willpower or whatever we’ve been doing to try to hold ourselves back ends up weakening and we just go and plow through it, right? But when you feel the emotions and know that no emotion is too strong for you to handle, then you’re able to take actions that are congruent with your goals, which is to go yeah, that brownie looks good, I’m not going to eat it. Right? Very simple. So, spend some time thinking about where you create feelings of restriction and deprivation in your life. Focus on becoming aware of what the thoughts are that are creating these feelings for you. This can seriously be one of the things that takes away all the weight loss drama for you. Just recognizing it’s not the plan, it is the way you’re thinking. The best news ever. So can’t wait for you to give this a try. I’d love to hear what you think over on the show notes page, which you can find at katrinaubellmd.com/95. And, hey listen I wanted to ask a favor of you. 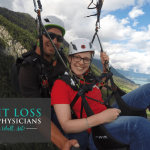 I wanted to ask if you could share this podcast with your favorite doctors in your life. My goal is to get this into the hands of doctors, even that don’t need to lose weight, because this work is helping so many physicians. As we all know, when the doctors are feeling good, they take better care of all of us. Right? I want my doctors taking care of me to feel good about themselves and to not be feeling all up in their heads and feeling terrible and having a hard time. I would love it if you could share this podcast on your Facebook page, tell your friends about it, tell your doctor, your personal doctor about it and just spread the word. It would help so many other doctors, which really is my mission here. All right. Have a wonderful week and I will see you next time. Take care. Bye bye. Thanks for joining me today. If you liked what you heard here, be sure to hit subscribe in your podcast app so you never miss an episode. You can also get my Busy Doctors Quick Start Guide to Effective Weight Loss for free by visiting me over at katrinaubellmd.com. Hey Katrina! I LOVE your podcast. I started listening a few of months ago and binge listened to every single episode! It has transformed my way of thinking, not just about weight, but about my whole life! I have a question, for you, not directly related to this week’s podcast. Maybe you can cover it in a future Q&A podcast! I’ve lost about 20 pounds since I started listening. When people ask how I lost the weight, I never know exactly what to say, because really all I did was change my thinking… which sounds crazy even to me, but it worked! My problem now is that people have begun commenting on my weight constantly and it makes me super uncomfortable. Lots of thoughts creep in no matter what is said. When someone compliments me I think “I must have looked really terrible before!” When someone implies I’ve lost too much (I haven’t, my current BMI is 24) I think “I must look unhealthy.” Either way I end up feeling terrible and do not know how to respond. I hate that so much attention is placed on our bodies, both positively and negatively. How can I reframe my thinking so that it does not impact me so much? ?